Greece may as well have gone to hell in a handbasket. 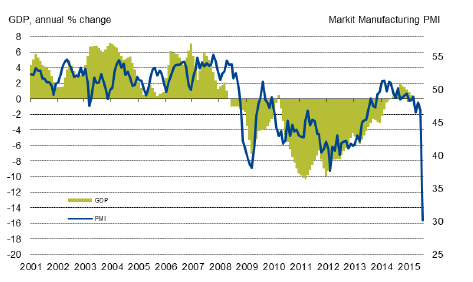 Carnage is everywhere one looks, but let's start with the Markit Greece PMI report that shows record manufacturing contraction. July saw factory production in Greece contract sharply amid an unprecedented drop in new orders and difficulties in purchasing raw materials. The headline seasonally adjusted Markit Greece Manufacturing Purchasing Managers’ Index® registered 30.2, well below the neutral 50.0 mark and its lowest ever reading. Record contractions were registered for almost all variables monitored by the survey, including output, new orders, employment and stocks. There was also a record lengthening in suppliers’ delivery times. July’s sharp decrease in the level of new business at manufacturers surpassed the previous record set in February 2012. Panel members commented on the impact of capital controls on demand, and also cited a generally uncertain operating environment which further weighed on sales. A sharp and accelerated decrease in new export orders (also a series record) added to the overall reduction in new work. July’s survey signalled the steepest drop in factory employment ever recorded during the 16-plus years of data collection. The decrease was the fourth in successive months, following marginal job losses throughout the second quarter of the year. A lack of availability of supplies meanwhile contributed to a rise in average purchase prices, with the rate of cost inflation accelerating from the previous month to the second-fastest since September 2012. In contrast, prices charged by manufacturers for goods decreased to the greatest extent for over two years, the rate of decline notably more marked than the moderate pace of deflation recorded during the month before. The Financial Times reports Greek Businesses Left Gasping as Capital Controls Bite. “Good and healthy companies that survived the crisis have been rendered helpless because they can’t import raw materials,” said Constantine Michalos, president of the Athens Chamber of Commerce and Industry. As frustration mounts, the Piraeus port in Athens has become a maritime parking lot to about 8,000 shipping containers waiting for importers who cannot yet pay the outstanding bills on their shipments. Rena Simou, a clothing retailer who operates outlets on several popular tourist islands, said her business is headed for collapse if she cannot deliver stock before mid-August when the summer tourist season begins to wind down. Why did you have a Greek bank account? The smart money got out long ago. I'm not blaming people for being dumb. Rather, I simply point out that being economically illiterate has its consequences. Those lowest on the totem pole will take the hardest hit. No one but creditors have been bailed out. The average person on the street has been brutalized. When the carnage appears to be over, those who were smart enough to get the hell out, will have plenty of money to come back in and purchase bankrupt businesses and properties at rock-bottom prices. The stock market collapsed yesterday following its restricted reopening. 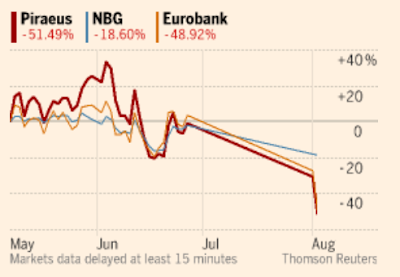 On Monday Greek Bank Shares Crash 30% as Market Reopens. Shares in Greek banks crashed 30% Monday as trading resumed on the Athens stock exchange for the first time since the country was nearly forced to abandon the euro last month. The benchmark index in Athens opened nearly 23% lower, with banking stocks the biggest losers. The country's four biggest lenders -- Piraeus (BPIRF), Alpha Bank (ALBKF), the National Bank of Greece (NBG) and Eurobank all plunged 30% -- the daily limit -- immediately after the open. Stocks in other sectors recovered slightly during the session but the index still shed more than 16% by the close. Today, Bank Shares Hammered Again. Capital controls will destroy what's left of Greece.